Makyo is a Tokyo-based 5-piece band known for its unique tribal dub sound, fusing Indian and middle-eastern instruments & percussion with live electronica and mystical oriental dance. The band is centered around producer/dj/remixer Gio Makyo, who has composed ethno-ambient & dub music since the early '90s, working on mixes and remixes with such artists as Bill Laswell, Natacha Atlas, Cheb-i-Sabbah, Omar Faruk Tekbilek, Solace, and Shahin Badar. Gio has defined his sound over the course of 5 albums, and live he brings a hands-on, real-time approach to dropping beats & bass & synths, while dub mixing all the acoustic instruments as well. Jimi Miyashita, a top student of Indian maestro Shivkumar Sharma, performs on the 72-stringed santoor, while multi-instrumentalist Madoka Sakuma contributes on electric saz, oud, Afghani rubab, and guitar. Percussionist Junzo Tateiwa, known for his work with Japanese prog-rock band Ghost, plays Indian tabla, darbukka and daf. Finally, mystical bellydancer Hayati brings her flowing and expressive "ambient oriental" style to the front of the stage. The band formed in late 2009, and has gigged regularly at clubs, lounges, and outdoor parties throughout Japan; their first overseas appearance was at Portugal's massive BOOM Festival in 2010, where the band played the closing set on the Sacred Fire Stage. 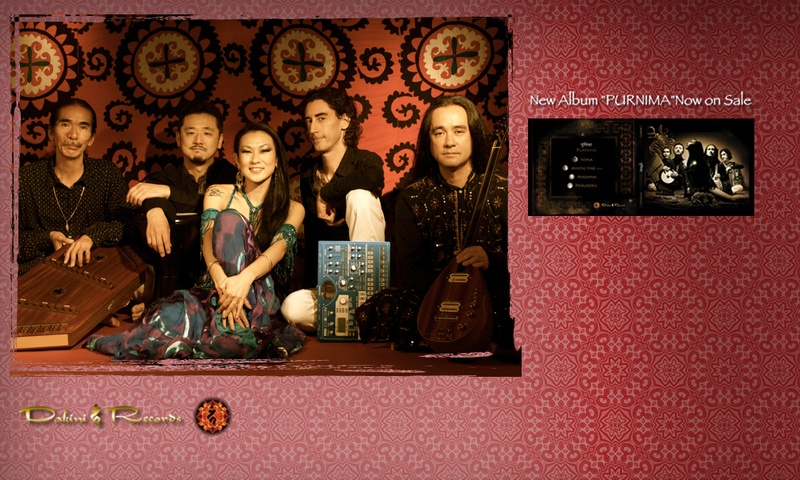 Makyo's new album, "Purnima" is out now on Dakini Records. top > index > makyo Copyright (C) 2012 HAYATI All Rights Reserved.